"I was summoned to the hospital 4 hours later. The patient had received her blood transfusion and had been resting when suddenly the heavy bleeding began again. I took her directly to the OT for surgery." 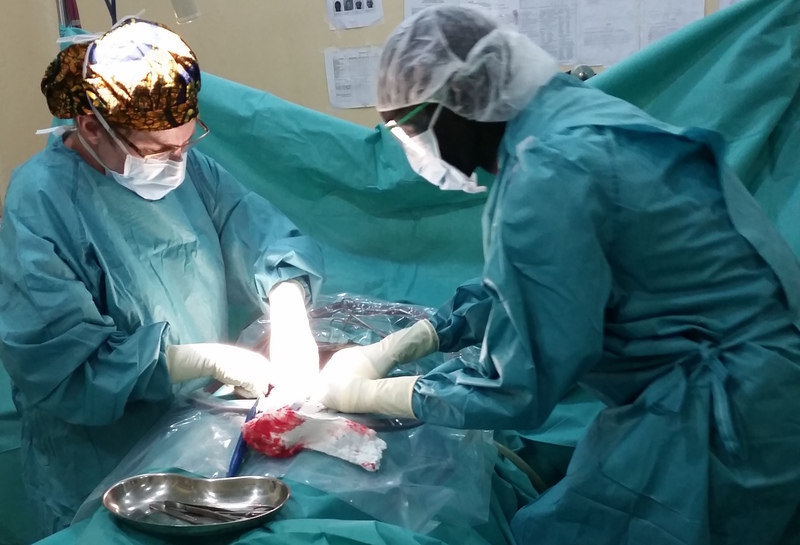 As the only OB/GYN in MSF’s maternity ward at Aweil State Hospital, one of my principal roles is to perform emergency pelvic surgery for women. A secondary role is to provide instruction to the national midwives and nursing students in the maternity ward. I enjoy and value teaching as a means to leave something lasting behind from my mission. I was recently called to the hospital for a postpartum hemorrhage. The woman was 9 days post-op from an uneventful C-section with twins—Baby A was in a breech position with cord prolapse. She had experienced sudden, profuse vaginal bleeding at home, “like a cow had been killed,” according to her husband. When I arrived at the hospital, the national midwives and nurses were suggesting that I might need to take the patient back to the OT (operating theatre) to do a hysterectomy for presumed uterine rupture. She had been administered IV oxytocin to contract her uterus and my quick evaluation found it to be firm, non-tender, and the appropriate size, as well as empty by portable ultrasound. The bleeding had largely subsided and I noticed that the blood in the pan at the end of the exam table had clotted well. Her blood count was extremely low, however, indicating that she indeed had lost a significant amount of blood. As we waited to receive blood for transfusion from the blood bank, I took the opportunity to teach. We discussed uterine rupture, a far too common obstetric disaster in this setting, resulting in life-threatening hemorrhage for the mother and often death of the fetus. It is rare in developed countries, occurring almost exclusively in women with a prior C-section. But here, women without a prior C-section scar to weaken the uterus experience uterine rupture during labor. The reasons are likely to be multifactorial: prolonged, unmonitored, obstructed labor; short interpregnancy intervals; and possible nutritional factors. But I explained to the worried staff that uterine rupture cannot occur postpartum when the powerful contractions are no longer exerting pressure. Other causes of significant postpartum hemorrhage were also ruled out, including retained placenta and infection. The patient had no fever or unusual uterine tenderness. I decided that the blood vessels had become dilated in order to accommodate the placenta where it had been attached to the uterus—a case of “placental site subinvolution”—which caused the bleeding. But in this situation, I explained, the bleeding is generally self limiting.The blood for the transfusion arrived and I headed back to the compound for some sleep. I was summoned to the hospital 4 hours later. The patient had received her blood transfusion and had been resting when suddenly the heavy bleeding began again. I took her directly to the OT for surgery. The fundus (top) of the uterus was pink and healthy-looking, as were the other abdominal organs. There was no blood in the pelvis. The uterine sutures were present but the two sides of the incision appeared to have pulled apart and they looked grey and bloody at the edges. I had never seen anything like this before. The double layered incision was separated. Rather than removing the old sutures, cleaning the edges, and re-suturing, I thought the least risky approach would be to do a hysterectomy. I did not want to risk poor wound healing again days later or possibly worse, a full blown uterine rupture with a subsequent pregnancy. The patient did well post-operatively. Last week, I was asked to evaluate a woman with a possible ectopic pregnancy. The woman arrived looking well, but complaining of mild abdominal pain and light vaginal bleeding. Her last menstrual period was 2 months prior. Her pregnancy test was positive and her blood count was normal. The midwife had done an ultrasound and it appeared to him that a pregnancy was present, but that it was outside the uterus. When I arrived, the patient had gone to the market! I was assured she would be returning soon. Before seeing her I was skeptical of the diagnosis, since clearly she was stable and feeling well enough to shop. I discussed the usual signs and symptoms of ectopic pregnancy with the midwives—significant (often one-sided) pelvic pain, often with a low blood count as the involved fallopian tube bleeds. Ectopic pregnancy is considered an emergency, since the tube can rupture causing catastrophic hemorrhage and death. The woman returned to the hospital after having eaten dinner. To my surprise the ultrasound showed an embryo with heartbeat measuring 8 weeks 3 days, clearly outside of her uterus in her right tube. Because she had just eaten and was so stable, we scheduled her for surgery the following day. During surgery I removed the large, swollen right tube containing the perfectly formed embryo. The patient had minimal blood loss and recovered well. 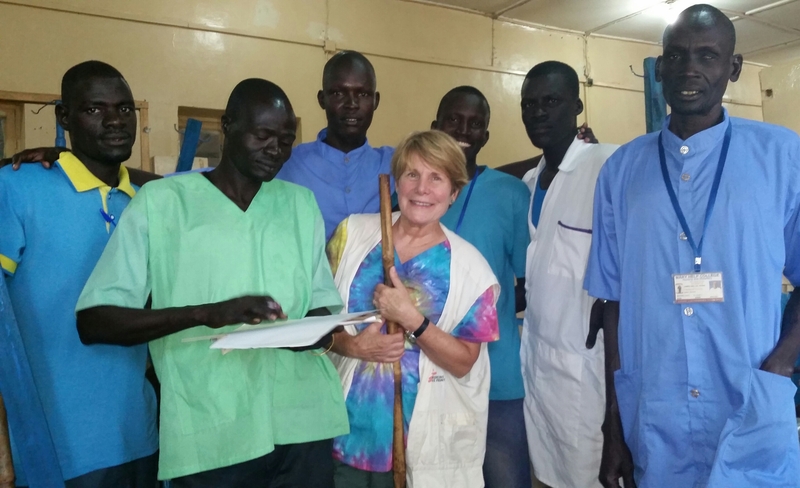 As I contemplate these and the many peculiar cases I have seen during my time working in South Sudan, I realize that the local midwives were right. The first patient did, in essence, have a uterine rupture and needed a hysterectomy. The second patient, although stable with minimal symptoms, indeed had an ectopic pregnancy. While they have not had as many years of training or clinical experience as I have had, the national maternity staff have witnessed countless obstetric emergencies and clinical presentations unfamiliar to me. So I have grown more receptive to their ideas. I continue to teach proven “textbook” obstetrical principles. But I now keep a more open mind to potential diagnoses, acknowledging of the contribution of local wisdom.